Hi everyone. I have a few racks that Ive created I'd like to share with you all. Ive got a little tutorial on how they work on my Tumblr. Check it out it you want. http://me7a7r0n.tumblr.com You can download my racks for free from here http://snk.to/f-c7umecnx , http://snk.to/f-chjf69ic and http://snk.to/f-c7c3ykj1 . Please let me know if you like them. Thanks. I just started a tumblr page, too. I zipped up some of my favorite custom racks and you can see some in action here. ???? ??? ???? ??????? ???? ????? ??????? ???? ????? ???? ??????? ???? ????? ??? ??????? ???? ?????? ????? ??????? ???? ????? ????? ??????? ??? ?????? ?????? ???? ??? ???? ??????? ???? ??? ?????? ??????? ???? ????? ??? ??????? Cleaning villas and hotel rooms in Riyadh. That is a fairly unusual application of Live racks. you are a clever crazy person. very nice. After a not particularly fruitful search for a highly liquidy, clear, and vowel-like software envelope filter that would work especially well with bass while not being overly thick sounding (desirable for many, but not the right sound for my mixes) , I decided to see what I could make using only Live 9. The envelope in the auto filter functions really well, but the filter itself was too tame on its own for my purposes. However, after chaining a bunch of them together I came up with a rather squishy envelope filter - which I have named Pudding. Pudding was built with bass in mind, but it works great on any dynamic audio source. Last edited by csciurba on Sun Oct 12, 2014 8:00 pm, edited 3 times in total. Dissatisfied with the software envelope filters I had tried, I decided to see what I could make using only Live 9. The envelope in the auto filter functions really well, but the filter itself was too tame on its own for my purposes. However, after chaining a bunch of them together I came up with a rather squishy envelope filter - which I have named Pudding. Sounds nice, but what is in the zip file? It does not download as a live rack. re:dream wrote: Sounds nice, but what is in the zip file? It does not download as a live rack. Thanks for letting me know! I'm not sure what was happening there, but the file was losing its extension when unzipped. Even when I created a new zip, archiving/unarchiving it using the built-in Mac utility resulted in the same problem. I've used an RAR utility instead now, and this one appears to be extracting properly. I've fixed the link above, but I'll add it here too. jasinski wrote: Share your useful, creative, crazy, or just weird racks. Good collections of free and commercial Live racks and other stuff. A bunch of racks and other goodies to download. A list of racks and other Live stuff. Many of these look to require Sampler or Operator. Check em out. Poly-Neptune Volume 2 Free rack instrument. Also tons of other free racks on Audiobombs. Thank you for posting this. I cant wait to try some of these. edit: jk most of the ones i wanted to try were broke. lol didnt realize this was from almost 10 years ago. One of my favorite tricks with the instrument rack is to load a bunch of plugins and use the chain selector to switch between them. 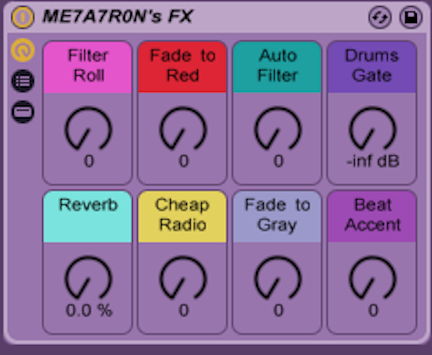 To take it even further, you can control the chain selector with a M4L LFO and get some really glitched sounds.